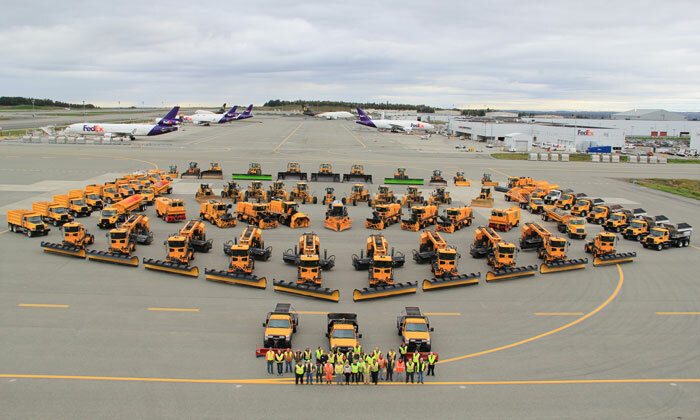 The Ted Stevens Anchorage International Airport (ANC) Airfield Maintenance team builds upon an impressive track record with each new winter season. Zaramie Lindseth, Airfield Maintenance Manager, explains how the airport is never standing still when it comes to finding new ways to further improve their winter weather operations. Ted Stevens Anchorage International Airport (ANC) has never closed due to a snow or ice storm. This impressive feat is accomplished by a talented group of 109 professionals including equipment operators, mechanics, electricians and others. 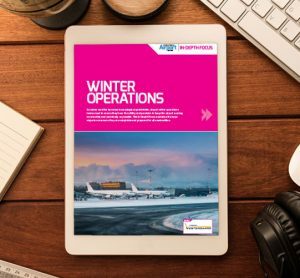 With each winter weather event these snow fighters skilfully navigate a network of 33 million square feet of runways, taxiways, and aprons to ensure surfaces are cleared for safe aircraft operations. The ANC snow fleet is comprised of over 80 pieces of equipment. Manufactures include plough trucks, sweepers, and snow blowers from MB Companies, Oshkosh and Wausau; loaders from Caterpillar and Volvo; spreaders and truck chassis from Tyler Ice, Mack and Freightliner. Winters in Anchorage have drastically fluctuated over the last five years, with the driest on record followed by the snowiest winter on record of 134 inches. For comparison, the average annual snowfall for Anchorage is 75 inches. Ice storms of course are the most challenging and they too have increased in frequency and duration in recent years. We typically encounter 65 weather events a year that require active treatment of the airfield. 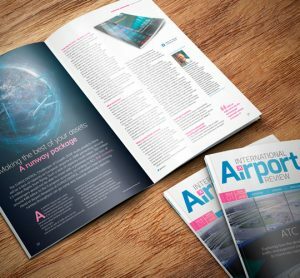 ANC is within 9.5 hours of 90 per cent of the industrialised world, making it a strategic link to Asia and the Pacific Rim and a major component in global aviation. Location is one reason the airport is the sixth busiest cargo destination in the world in terms of cargo throughput, and second largest in the United States for landed weight of cargo aircraft, accommodating approximately 500 wide-body landings per week and five million passengers annually. The airport also operates the world’s largest and busiest seaplane base which is maintained for ski equipped aircraft during the winter months. 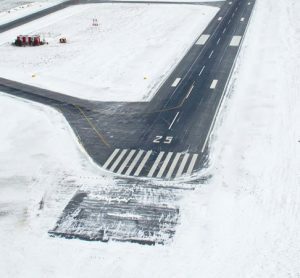 With three runways in excess of 10,500ft, a web of 27 taxiways, and approximately 33 million square feet of airfield pavement, the snow plan is comprehensive but simple by design. The plan is initiated with the imminent onset of precipitation. Our predetermined primary snow fleet attacks the movement surfaces of the airfield as additional crews are dispatched for aprons, landside facilities, and the road system. While the snow or ice event is in-progress, a predictable rotation of ploughing and sweeping occurs on each of the ‘priority one’ surfaces. If the duration and intensity of a storm begins to burden our resources, the focus shifts toward keeping a smaller taxiway network operational while continuing to accept arrivals and accommodate departures at reduced rates. All units within the snow fleet receive an extensive annual preventive maintenance inspection. This essential aspect of a successful programme occurs throughout the summer months to ensure equipment is ready at the onset of winter. Operator training is yet another aspect that begins early. As September approaches the crews will begin running simulated snow and ice control exercises. This has a multifaceted benefit. It allows crews to shake out issues with the equipment early on and provides familiarity with equipment that has not been utilised in several months. The snow team participates in in-depth meetings to ensure each participant is aware of their responsibility in the snow and ice control plan. Throughout the season operators are required to complete employee development modules comprised of both written and hands-on exercises which are intended to provide in-depth knowledge of machine functions and application. These challenging modules focus on improving responses to deficiencies as well as any recurring elements in our programme that need adjustment. Preparation also involves our stakeholders. Preseason meetings are held to engage our stakeholders to include tenant contractors, air carriers, and Air Traffic Control (ATC). These meetings serve a critical function for us to hear from our users what their challenges are and how we may be able to best respond efficiently and effectively. Modern equipment with extensive technological advances are critical tools, but ultimately the team of skilled professionals at the controls is what allows us to achieve high levels of efficiency. Key personnel with years of knowledge and proven judgement are what make our programme great. Our equipment operators are cross-trained in all pieces of equipment, both summer and winter applications, which provides great flexibility within the department. With such a diverse snow fleet this is a reflection of the talent we are fortunate to have. The constant exposure to frequent winter weather and the opportunities to exercise the plan in real world conditions maintains the crews performance at optimal proficiency levels. With the exception of extreme variables, the same plan is followed with each event. Our processes for clearing runways has been fine-tuned and vetted by years of experience to yield the most efficient results. Routine is a positive attribute in the midst of a dynamic snow and ice event. 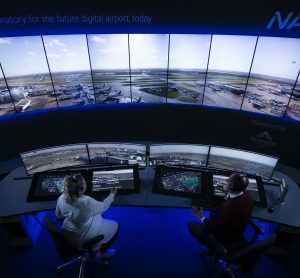 This is extremely beneficial not only to our own crews, but to ATC and users alike. Communication and decision-making processes are streamlined when all parties are able to predict the next steps before they even occur. Once the plan is activated, our goal is to have sweeping operations underway in 15 minutes or less, and the priority runway cleaned within 18-22 minutes. 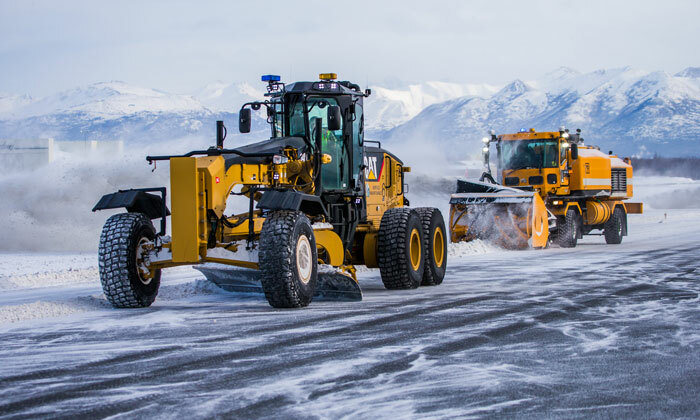 Runway cleaning operations typically occur in a two-pass operation with six plough and broom combination units, a snow blower, and variety of de-icer units. Airfield maintenance foremen immediately conduct friction readings following treatment actions to determine effectiveness of our efforts and strategies. That data, in conjunction with Vaisala pavement sensors, allows us to disseminate timely information to air carriers. De-icing chemicals are shipped by barge from Seattle, taking approximately 20 days to travel nearly 2,000 miles. Ensuring adequate inventories of these products are available locally when needed is an ongoing challenge that requires continuous communications with suppliers and shippers. Inventory monitoring and benchmarking against archived consumption rates allow us to hone our forecasted needs. ANC continues to explore, test and implement new strategies to add efficiencies to our programme. As a facility we move between 3-6 million tonnes of snow every year. Transporting that snow in the most efficient manner possible offers one of the greatest opportunities for improvement. Over the course of the last five years we have incorporated the use of loader mounted ramp cupping ploughs produced by MB Companies. These units have revolutionised the speed and quality at which we can clear large cargo and passenger aprons. In the past we used standard U-blade type loader ramp ploughs that required individual pushes to snow stock piles. The use of cupping ploughs allows us to quickly consolidate the snow with windrows, and then move the windrows to stockpiles with large loaders equipped with massive U-blades. The airport recently worked with Weldco-Beals Mfg. to build a blade and bucket specific to our needs. The blade in combination with a Volvo L350F loader is capable of moving 45 cubic yards of snow with each pass, and loading 21 cubic yards of snow with each bucket. The airport now has five cupping ploughs ranging from 27-35ft and four large loaders with 45 cubic yard U-blades. The airport is fortunate enough to have long-term snow disposal areas in close proximity to our main facilities, making hauling snow the most economic means of snow disposal. In years past the snow haul fleet consisted of 16-yard end-dump trucks. Those have recently been replaced with a tractor-side dump trailer combination with a snow haul capacity in excess of 30 yards. Now one unit can move double the amount of snow with the same number of operators. The other benefit is we are able to dump those loads without stopping and backing to a pile. This advancement alone has resulted in a 400 per cent increase in snow haul capacity. What typically would have taken a week to clear temporary snow piles from our aprons is now completed within two shifts. The ANC Airfield Maintenance mission is to maintain safe aircraft movement surfaces, public roads, walkways, and other exterior airport infrastructure. Each winter is another opportunity to maximise and improve on the efficiency and effectiveness of the fleet management and snow removal operations. As aforementioned, we accomplish this mission using accepted industry practices, innovative thinking, and years of experience to find alternative means to provide the highest level of service. Bring on the snow! Zaramie Lindseth joined Ted Stevens Anchorage International Airport (ANC) in 2001 and has worked in commercial airport operations for over 19 years in various positions involving planning, coordination and oversight of airfield maintenance and operations. Zaramie has managed the Airfield Maintenance section since 2012. He was an Operations Officer for nine years before moving into a management role as the Assistant Manager. His airport career began as an Operations Supervisor with the New Orleans International Airport. Zaramie is a graduate of Embry Riddle Aeronautical University.